Recent news surfaces regarding the radiation level from mobile phones we use. To measure the radiation from the phones, we use SAR, also mentioned in the device specifications. There is separate research going on for the hazard of the radiation from the phones, which is not yet proven. But do you ever care about the SAR value while buying a new mobile phone? Scientists or computer literates perceive to buy smartphones with lower SAR value. Let’s find more about the measure of radiation from your phone with SAR. You will also find the least radiating and most radiating mobile phones for 2019. As we carry our mobile phone all the time and keep it near to us, we should be careful about the radiation from smartphones. 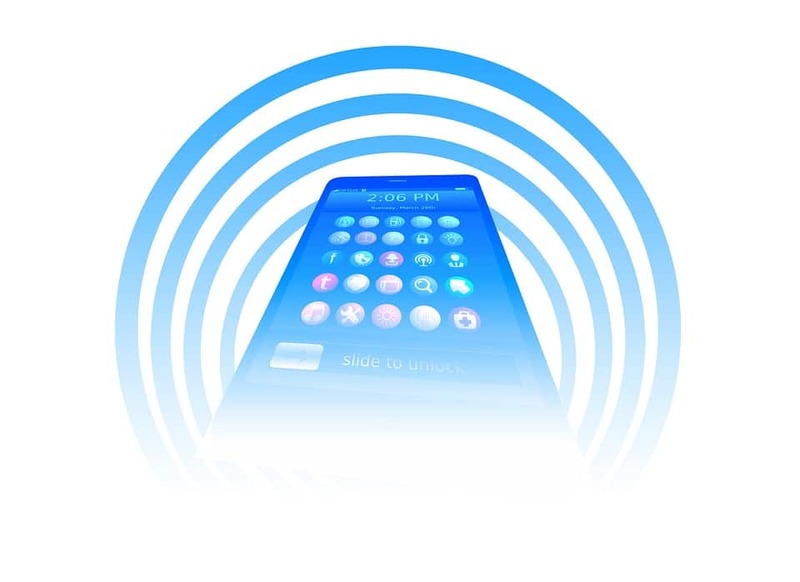 To carry the voice and data information, Mobile phones communicate with the cellular base stations wirelessly, through Electromagnetic wave (EM wave). The frequency spectrum of operation of mobile/cellular signal is High frequency (HF) ranging from a few hundred MHz to few GHz. We have once posted about the radiation from mobile tower but this is regarding the radiation from the mobile phone. The body part, exposed near to the phone, absorbs the part of the RF energy radiated. The measure of such absorption is given by SAR, which is an acronym for Specific Absorption Rate. SAR provides the measurement of exposure of RF energy radiated from mobile phones and to keep it within some limits to save the user from any hazards. SAR is measured in units of Watts per Kg. Some studies suggest a slight increase in the temperature of the body due to the exposure. Some also studied, relating the exposure to a headache, sleep quality, tumor, cardiovascular effects. The effect they say depends on the exposure duration, frequency, exposure level (distance from the cell phone). But none of the studies confirms the direct effect of such mobile phone radiation to human. According to ICNIRP (International Commission on Non-ionizing radiation protection) guideline, the SAR value of the phones should not cross beyond 2 W/kg for no hazards. Actually, most of the phones meet this guideline. Europe takes this value as the upper limit for SAR of mobile phones Whereas the US takes the value of 1.6 W/kg. There is no such universal standard for the emission level to be not harmful. German Federal office for Radiation Protection (BFS) provides a database of most of the phones available. For the German certificate for environmental friendliness known as the Blue Angel (Der Blaue Engel), the SAR value should be less than 0.6 W/kg. 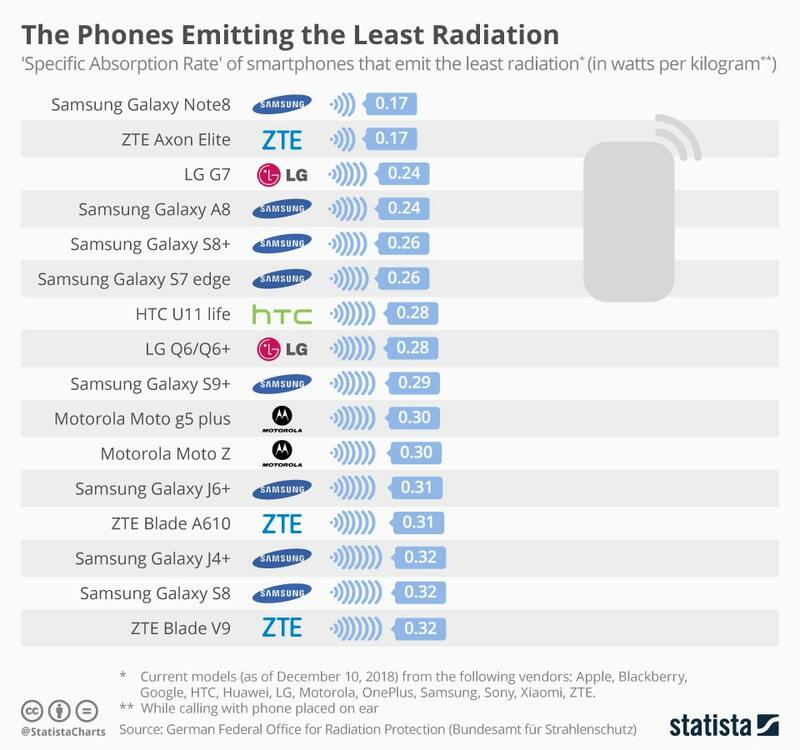 From the German Federal Office for Radiation Protection (Bundesamt für Strahlenschutz), Statista provides the latest list of smartphones with different levels of radiation. It seems like they perform a test of their own to calculate the SAR. As per the list, Xiaomi Mi A1 tops the chart with the highest SAR value of 1.75. 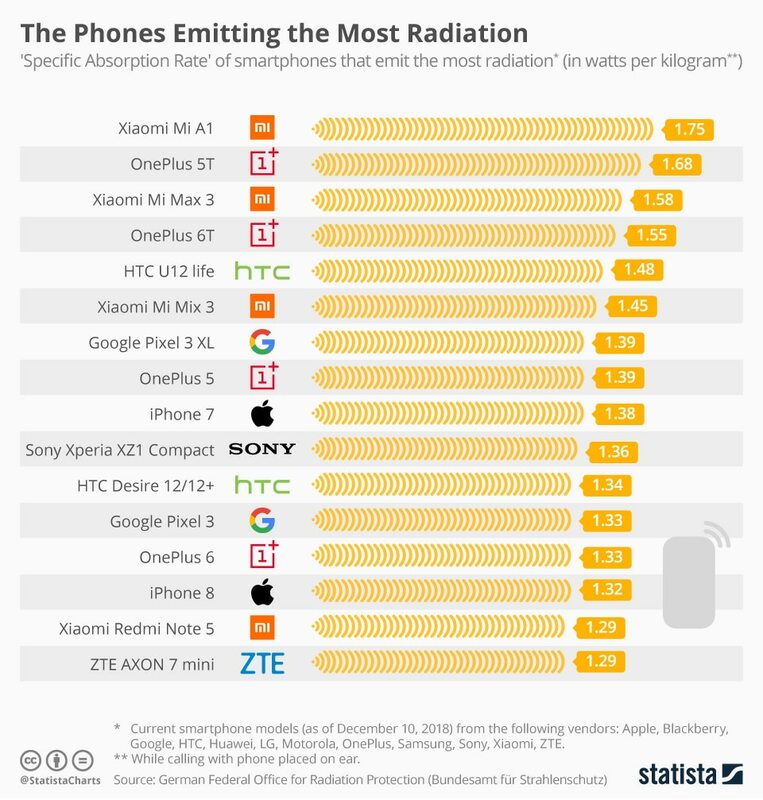 Other phone manufacturers like Huawei, OnePlus, ZTE from China and Apple from the US join the list for the high radiation. There are three versions of iPhone itself; namely iPhone 7, iPhone 8 and iPhone 7 plus. All the smartphone listed here have SAR value higher than the value of 0.6 W/Kg for blue Angel certification. Similarly, the list of less radiating mobile phones includes Samsung, LG, ZTE, Motorola. Where Samsung Note 8 has the least radiation level with SAR of just 0.17 W/kg. There are 8 models of Samsung in the least radiation level, like Samsung Galaxy A8, S8+, S7 Edge, S9+, J6+, J4+, S8. All the smartphone listed here have SAR value lower than the value of 0.6 W/kg for blue Angel certification. If you care, now you have one spec to look after while buying a new mobile phone. Although the SAR values of Chinese smartphones have higher value, it does not suggest direct health hazard. But we suggest to buy phones with lower SAR value and also reduce the time of exposure while taking (for exposure to head) or carrying in your pocket. NTA clarifies for Mobile tower radiation effects.